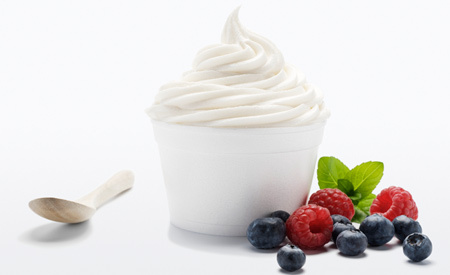 If you're looking for a frozen treat that is a but healthier than ice cream, then consider frozen yogurt. There are many flavors that are available, but vanilla frozen yogurt is one that will offer the most options when it comes to the toppings that you can add. It's also a good flavor to have on hand if you operate a frozen yogurt business as it's one that many customers tend to enjoy. One of the benefits of using vanilla is that you can turn it into any other flavor or any other creation. It's ideal for using at a birthday party as you can set out bowls of toppings, such as candy pieces or fresh fruits, so that guests can make their own special treats. This also works in a business as customers can use a cone or bowl to make their own creations without worrying about definite items that they have to use with the yogurt. Turn your frozen yogurt into ice pop by putting the yogurt into a mold and adding a few pieces of fresh fruit or even candy pieces. You can transform your vanilla yogurt into a fun treat on a stick, making it a soothing delight for a hot day. Another idea is to put the frozen yogurt between two cookie pieces to make a sandwich. You have probably ate ice cream sandwiches, but if you use sugar-free cookies or those with low fat, then you'll have the same treat as you would with fewer calories. Another idea is to make a pie with the yogurt as a filling. You could drizzle chocolate syrup on top or combine the yogurt with other ingredients that are blended in for the entire filling of the pie. The yogurt will usually give a lighter texture to the pie and can stretch some of the ingredients that you have on hand if you're looking for a sweet treat but don't have everything that you need. Once everything is combined, you can freeze it until the pie sets so that you have a frozen treat to enjoy at any time.